Weve written elsewhere of just how precarious the finances of most Pagan clergy can be. We dont have congregations supporting us, paying our rent, covering our medical care, bringing us groceries, etc. Most of our community is so donation-phobic that it never even occurs to them to pass the hat after rituals or other major events. Yet those of us who work with large numbers of people, or who trudge around the country presenting workshops and seminars, or who have dedicated large parts of our working lives to helping our community, usually wind up living at a much lower economic level than the average Neopagan, while dealing with higher stress levels. Isaac is still handicapped from his long-ago tryptophan poisoning (see below), especially during cold and/or wet weather. He cannot hold down a secular job because employers and clients get upset when he falls asleep after a few hours, his marketable computer skills are obsolete, and few companies want to hire older workers. He cant write for more than a few hours at a time because of the pain in his hands. No matter how famous he may be as a writer and speaker inside the Neopagan movement, his income from writing and presenting is tiny (especially compared to equally famous New Age authors). Phaedra is mildly handicapped by arthritis and sciatica, which prevents her from taking a second job. The job she has now barely covers the rent, with little left over for utilities, car payments, medications, groceries, etc. We would not have made it through last winter without losing our home, if it hadnt been for the generosity of a couple of dozen folks. This winter looks even worse, as the Bush Depression has killed the festival movement (the source of Isaac's income from speaking) at the same time buyers of home furnishings (Phae's source of income) have been cutting back drastically. Even with the start of our two wedding sites, Hudson Valley Civil Ceremonies and Unusual Ceremonies, we had an income drop of 20% for both 2007 and 2008, even while the cost of everything (including rent, utilities, and groceries) has been rising. Phaes commuting expenses are low, thanks to a branch of her Select Comfort Sleep Number store (be sure to contact us for her work phone number after you browse online) in the huge Palisades Mall in West Nyack, NY (a mile and a half from where we now live). Your purchase of goods and services enables us to keep doing our work. The lower our stress levels, the easier it is for us to write additional new books, update older ones, travel to teach, run an online school, create new graphic and jewelry designs, perform unique weddings and other rituals, and make other contributions to our healthy Neopagan culture. Your donations in 2005 and 2006 kept us off the street and enabled Isaac to finish three books: The Pagan Man: Priests, Warriors, Hunters, and Drummers, Bonewitss Essential Guide to Witchcraft and Wicca. and Bonewitss Essential Guide to Druidism. Your donations, purchases of books and other products, and the donations for speaking and performing weddings in 2007, supplemented Phaes salary and commissions to make possible yet another new book by the both of us: Real Energy: Systems, Spirits, and Substances to Heal, Change, and Grow, and Neopagan Rites (formerly Rites of Worship), Isaac's groundbreaking work on public Pagan liturgy. Is there a solution to involuntary vows of poverty for Pagan Elders? We both have noticed over the years that most Neopagans (even during hard times) may have money for the things they really want: books, music, jewelry, clothing, fancy magical tools, beer, pizza, CDs, videos, iTunes, etc. (although we know that even fun purchases are dwindling). So we have been spending the last few years trying to produce tangible goods and services, with which to support ourselves in ways that wont offend those who believe in the holiness of poverty (at least for Pagan clergy). Read on to see what those products and services are. We know everybody is hurting financially right now. The Bush Depression wiped out the moving money we were beginning to accumulate. This year Isaac will turn 60 and Phae isn't that far behind (sorry, dear). There is no retirement plan for Pagan Elders, only the generosity of those who think our work has been valuable. And as Isaac notes in the essay called Adopt an Elder, many other Pagan Elders are in serious straits this year too. If you can't help us, at least help someone else who has dedicated their life to Paganism. After a great deal of thought, we have decided to cease selling autographed books, jewelry, or music CDs via this website. It just is not cost effective to lock money into inventory when our turnover is so slow. We encourage you to purchase our books at your local metaphysical shop, though they are also available at Amazon.com and major bookstore chains. Naturally, we will be happy to autograph your copies no matter where you purchase them! For jewelry and CD purchases, see below. Help us move to Oregon! We live in one of the most expensive parts of the USA (just north of New York City) and really need to move someplace cheaper, now that Arthur is safely off to college. We've been focusing our hopes on Ashland, Oregon for a few years now. Ashland is a small town just north of the California border near the coast and is home to the Oregon Shakespeare Festival, which runs ten months out of every year. So the whole town is filled with actors, musicians, writers, poets, and other creative folks, while having a large and steady influx of tourists. It's also Druid Central for the West Coast (hi guys!) with several different Druid groups in residence. Just the place for a couple of Pagan Elders to spend their later years! The fact that the cost of living is about a third lower than what we're paying now means that our meager income will stretch much further. There's a branch of Phaedra's store just thirty miles up the Interstate in Medford (a city that also has an international airport, so we can quickly and cheaply get there to fly off to gigs). Isaac hopes to open a tea and tarot parlor where he can write and teach when he's not giving readings. We estimate that the cost to move ourselves, our cats, and literally a ton of books, will be at least $10,000. Anyone who would like to help us out can donate using the PayPal button to the right of these words. As with our general support fund, you can also send money to us at PO Box 1010, Nyack, NY, USA 10960-8010. To learn more about and/or buy copies of our works, you can go to the Books page. To advertise on Neopagan.Net, click that link to go below. For descriptions of Isaac's jewelry designs, click that link to go below. To buy and download Isaacs recorded songs you can go to his SNOCAP Music Store on his Song pages. To buy posters, coffee cups, mouse pads, lunch boxes, tote bags, and t-shirts with Isaacs graphic designs on them, go to his Cafepress.com shop. To buy CDs of Isaacs music, to obtain his services for weddings or handfastings, or to arrange for Tarot readings by Isaac or Phaedra, click those links to see the information further down on this page. If you buy books from Amazon.com through links on this website, another tiny bit of your purchase beyong the regular royalties will (eventually) come back to Isaac and Phaedra. Or, you can also make a straight donation to Phaedra and Isaac through PayPal, using the boxes below and on most pages at this website. Finally, after over ten years of waiting, it looks like ACE will release Isaac's third (Real Magic's second) album of Pagan folk-rock sometime this spring. Check the ACE website for updates, or email them to inquire when the new album will be ready. 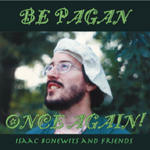 MP3s are now available from Isaac's Song pages. This talisman is meant to be used with a daily self-protection spell from Isaacs book The Pagan Man. His majesty as High King, His sympathy for the despised. His fire to enflame my speech, His mighty club to be my guard. 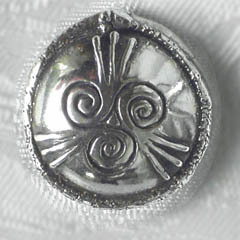 This silver or bronze talisman has been made by Merlin of Amulets by Merlin, based on the above design by Isaac Bonewits (includes the ogham letters for Dagda on the back).The design (inspired by Ian Corrigan) has a Celtic triple spiral as found in the Boyne River in Ireland, plus three awens (see below), with a snake wrapped around the edge of the shield. The shield as a whole is curved to cover one-sixth of a sphere to aid in visualizing it at all six directions. For jewelry purchases, please go directly to Isaac's page at Amulets by Merlin. The sign of the Three Rays is used by members of the United Ancient Order of Druids, the Ancient Order of Druids, the Order of Bards Ovates & Druids, and many other followers of Druidry. It can be seen as symbolizing Sky Father energy in balance with the Earth Mother energy of the Druid Sigil, as well as any of a thousand other sets of three ideas. 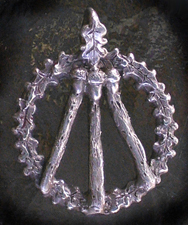 This version of the Mesopagan Druid symbol, available in silver or bronze, places the awen within a wreath of oak leaves and acorns. The result is the stunning item you can see here to the right. Show your devotion to the manliest god of them all: the All Father, the Good (at everything) God, the fabulous Dagda! Fiery father of the Gods of Erin, the Dagda is the Supreme Druid, the Mightiest Warrior, and Danus Most Fertile Stud. His famous club could kill or resurrect, depending on which end He tapped you with. Honor the Dagda by wearing this silver or bronze amulet, designed by Isaac (includes the ogham letters for Dagda on the back). This is a silver or bronze version of the pentacle+broom+staff logo (representing Witchcraft and Wizardry in service to Democracy), Isaac created for his Spells for Democracy movement. Activist Pagans have plenty of work to do now. Let people know that you are one Pagan who isnt sitting on their hands when magic needs to be done! To get this design as a bumpersticker, pin, coffeemug, mousepad, tshirt, etc. visit Isaac's CafePress Graphics store! To Neopagan Druids, the Druid Sigil represents Druidism in general and the Earthmother (Gaia) in particular (see Symbols of Druid Identity for details). This pendant, available in silver or bronze, is based on Isaacs evolved graphic design of a wreath of oak, yew, and birch leaves, with two oak staves in front. Any of these designs can be provided in bulk numbers. They are also available as a cuff-link or button-pin design to fit through buttonholes on your shirt cuffs or at your neck. The latter looks very distinguished for Pagan clergy. Contact Merlin for details. For a text ad with 1-5 link(s), or a 60 x 400-460 pixel graphic banner, the price would be $30 per month per page your ad appears upon, or $300 per year. For a 90 x 600 pixel graphic banner, the price would be $45 per month per page your ad appears upon, or $450 per year. That's two months free in either case! You might also want to consider a Spanish version of your ad to appear on the Spanish translations of the holiday essays and other items here that will be appearing over 2008, or translations into the various languages that the ABCDEF has been published in. Payments can be made to our PayPal account under the "ibonewits@neopagan.net" eddress. For those who keep track of advertising metrics, our Alexa rank is a healthy 461,844 and Yahoo Search shows nearly 20,000 incoming links from other sites. We have been on the Internet since 1996 and have had over 1.75 million visitors to date. To advertise on Real Magic School, just click that link! The disease is called Eosinophilia Myalgia Syndrome. It was named that in 1990 by the Centers for Disease Control in Atlanta, Georgia. It was caused by chemically contaminated l-tryptophan powder manufactured by the Showa Denko Pharmaceutical company in Japan. L-tryptophan itself is not poisonous. It is a basic amino acid, necessary for human health, and helps build muscles and nerves, as well as having a soothing and antidepressant effect. It is most commonly found in dairy products and turkey meat, which is why insomniacs will heat a glass of milk before going to bed, while others get sleepy after a traditional American Thanksgiving dinner. Unfortunately, the methods used to manufacture it commercially by feeding bacteria waste dairy products apparently added poisonous chemicals to the resulting compounds. In 1989 Showa Denko used a new strain of genetically engineered bacteria to produce higher concentrations of l-tryptophan, not realizing that they were also producing higher concentrations of the contaminants. Simultaneously, they decided to lower their filtration standards for vitamins and food supplements from those for human medicines to those for animal medicines. Thousands of Americans purchased and consumed the poisoned tryptophan, leading to mysterious ailments that baffled the FDA and the CDC until the truth was revealed. At that point, they simply outlawed the sale of tryptophan powder and stopped researching the disease. A few hundred people were killed, several hundred wound up in wheelchairs, and the rest of us suffered a variety of multisystemic problems including nerve, muscle, and joint damage. Since there is no profitable market for a cure to a disease that effects so few people, there has been little new research for fifteen years. Difficulty in googling information about all this may have been made worse by Isaacs habit of adding an "e" to the end of "tryptophan." If you run a business or non-profit organization with a website serving customers or members, consider using PayPal. They have worked reliably and quickly for us over the years and we highly recommend them. If you have a rite of passage coming up, Isaac and Phaedra may be available to provide Druidic, Wiccan, Generic Neopagan, New Age, or Secular clergy services to you. We've opened up two new websites: Hudson Valley Civil Ceremonies, for people wanting secular, new age, or nondenominational weddings, and Unusual Ceremonies, for Druids, Wiccans, Asatruar, Goths, Pirates, Furries, Trekkers, Nudists, Leather Folk, Atheists, Agnostics, Rennies, SCAers, and members of other subcultures and minority belief systems. Phae and I will be happy to help people get beautiful ceremonies that reflect their actual beliefs (or nonbeliefs) -- not just weddings/handfastings, but child welcomings, funerals, house blessings, and more. If there's one thing we're really good at, it's creating top-notch rituals. So wander on over and take a look. Let us know what you think.You may want to check our Schedule Page to see if he is already booked for your date. Phaedra and Isaac have some seventy years of Tarot experience between them. Isaac designed his own divination deck when he was 25 and Phaedra has taught Tarot classes for several years. Both are available to do telephonic readings with sufficient advance notice via email (see below) and in-person at festivals, psychic fairs, and bookstore events. A live webcam reading can also be arranged. After consulting with many other readers online, they now request a donation of $20 per fifteen minutes of reading over the phone or internet. Isaac also works at street fairs in the Rockland and Westchester New York area, as described on our Schedule page. Is having access to this material worth a few dollars, punts, pounds, or euros to you? Would you like to see more books from Isaac and Phaedra Bonewits,? Click the button to make a fast and secure donation to them so they can afford to keep this website and their writing and teaching careers going and growing! Or you can suggest to your local Occult/New Age bookstore that they bring him and/or her out for one of his or her colorful presentations, or you could visit their Blatant Hucksterism Page, or you could just send money to them at PO Box 1010, Nyack, NY, USA 10960-8010. Most recently updated: August 18, 2009 c.e.